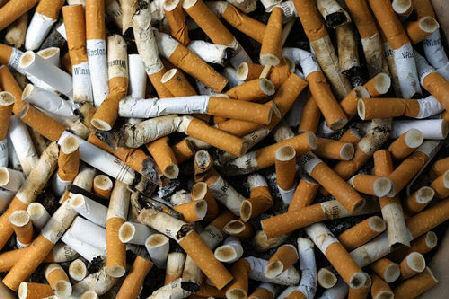 Illegal cigarettes are widespread here in Asia thus it is dubbed as Asia’s menace. The republic is keen on the issues of illegal cigarettes. The authorities will do a comprehensive island-wide survey to assess the supply of the illegal cigarettes here. On December 19, 2013, the SC (Singapore Customs) established a website called GeBiz. The survey will be completed on May 30, 2014. 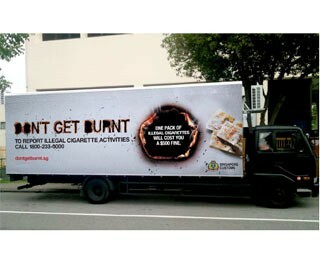 According to a regional study, Singapore is the fourth when it comes to illegal tobacco use in Asia. Brunei got the first spot followed by Hong Kong then Malaysia. With this, Interpol warned that the trade will stimulate criminal gangs and the proceeds can be used to fund terrorism-related activities. This is indeed alarming. It was mentioned earlier that cigarettes without SDPC mark will considered illegal. The SDPC make is printed at least 3 millimetre. The font is Arial Bold and its colour is black. But the colour may be changed as prescribed or approved by the Director-General. The SDPC mark should be at least 35 millimetre from the burning tip. 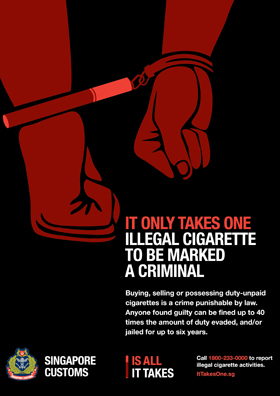 Apart from the SDPC mark, there should be vertical bars surrounding the cigarette. The Singapore Customs is very serious about buying and selling of duty unpaid goods like cigarettes. You should be familiar with the Customs Act and the GST (Goods and Services Tax) Act. Any evading actions will be dealt seriously. Offenders will face punishment. They will be fined forty times the amount of the duty they evaded and/or six years jail time. If you are first time offender, you will face a minimum fine of S$2000. If you are a repeat offender, you will face a minimum fine of S$4000. You do not need to be reminded of the bad effects of smoking. You should think that the joy it brings is only temporary but the effects will be permanent. You will suffer the effects later in your life. You can either survive or die from it. If you want to live long, just control yourself and do not smoke. Abandoning this unhealthy habit is not easy but if you really want to change, you will surely succeed.